We open on a montage of images from Detroit, MI - boarded and shuttered businesses and homes. Letting us know that, contrary to common belief, Detroit is not an economic Shangri-La of full employment where dreams come true and everyone, regardless of race, creed, or colour, goes to bed with a full stomach. Anyway, enough social commentary - let's hit the show! A man in a hoodie drags someone out of the cage he keeps in the back of his van. 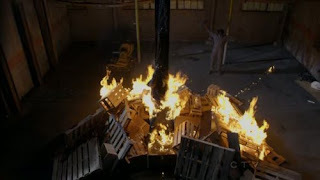 He drags the unconscious man by way of chains to a makeshift pyre he's created out of old wooden pallets. Then, as the man screams for mercy, the villain pours gasoline everywhere and lights the place on fire! 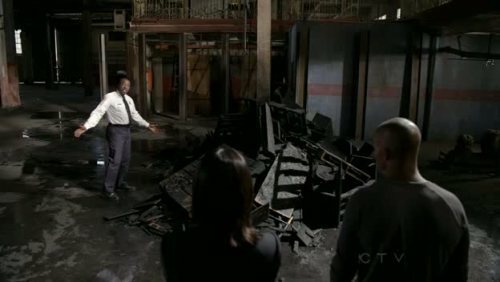 He then stands around to watch the victim burn, which seems super-dangerous, as things like pallets are often made from pressure-treated wood, and might well contain a variety of hazardous chemicals that can escape in the smoke when they're set on fire. Of course, the fact that he's raising his arms like a supervillian on the cover of a Spider Man comic and worshipping the flames suggests that this isn't a man overly concerned with long-term ramifications of his actions. Then we head over to Greg's house, where he's getting his son ready for Halloween! Which is apparently tomorrow night. His son doesn't want to dress as spider man (weird coincidence, right? ), but this can't be important, so let's move on. To the briefing! Where we discover that this killer has been murdering people annually in the three days leading up to Halloween, which Reid calls 'Devil's Night'. Isn't that just October 30th, though? Or have they expanded their arson activities a few days because of the overcommercialization of the holiday? Also, why has it taken the police three years to notice this pattern? You'd think during the first year, when one body turned up on each of the days leading up to Halloween, killed the exact same way, they'd be a little suspicious. Then, when a person was burned to death on October 28th the next year their suspicion would be confirmed, and the FBI would be called in! Why has it taken until the third year - did the show just want to jack up the body count for no good reason? That's just not true at all. Arsonists will burn anything they think they can get away with burning - which is why they tend to focus so much on abandoned buildings. If arsonists tended to burn dwellings with people in them, which would often result in deaths, then the police would pay way more attention xto them than they actually do. It's a dangerous crime, but unless it causes a death or was obviously used for insurance fraud or as part of an extortion scheme, there's a reason it's not really a high priotity to investigate. Still, the team wants to look into it, so off to Detroit they go! After the credits of course - although this week's round-table scene ends on the weirdest note, as Emily poses what the show seems to think is a brain-teaser designed to confound the team - how his he getting his victims across town and into buildings without being noticed? Seriously, show? How is that worth cutting to the credits on? He has a vehicle, obviously. Just like every other serial killer you've ever tracked. When was the last time you chased someone who didn't have a vehicle with a large trunk or a van to stuff a body in? Half-wit. On the plane they address the Devil's Night situation - it seems the The Crow lied to us all, and it's actually a 3-night vandalism festival in the streets of Detroit. Of course, with the crumbling of all Detroit's institutions, the fires have only gotten worse. The team's theories nonsensically mention how angry the killer must be (file that under duh), before centering on the place where the serial killer and arsonist circles cross - proximity to the investigation! 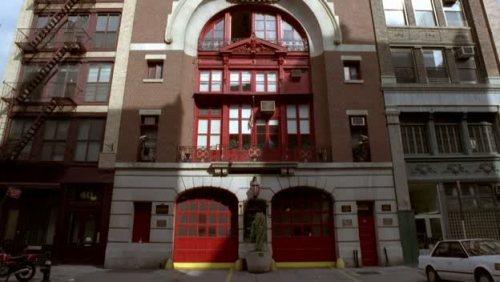 An old firehouse! Ah, Ghostbusters - you make everything better, don't you? Well, except for Extreme Ghostbusters, obviously. I don't even know why they bothered stopping by Ernie's office, though, since they immediately split up and heads to the morgue and latest crime scene. What do they expect to find in those places that Medical Examiners and CSTs haven't already? There's not much info at the morgue - the killer clubs people over the back of the head, then puts a bag over their face before burning them. Interesting, but nothing that couldn't have been said over the phone. Meanwhile Ernie shows Derek and Emily around the latest crime scene, while giving them some info about the neighbourhood watch group that looks out for the annual fires - more suspects for the 'close to the investigation' list! While not tiny by any means, as warehouses go, this is nothing impressive - if it would take you less than a minute to walk from one end of a structure to another, I can't see that it's large enough to be worth commenting on. Really, this is just another in the frequent examples I've found of the producers being unwilling to change lines of dialogue and story details to reflect reality on the ground. 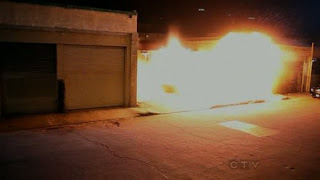 They then come to the conclusion that the killer must have researched reaction times, since Ernie's men were at the fire within five minutes of the alarm. The fire alarm that the long-abandoned husk of an engine factory still had, for some reason. Also, more dialogue suggests they weren't able to consider their location, as they talk about the unpredictability of fire and the killer's need for an escape route. Except he was never in any danger - he chose a building crafted exclusively from concrete and iron, then built his own bonfire, ensuring that it wouldn't spread. A more interesting psychological angle to probe would be why he's so determined to burn only the victims and not the buildings, thus ensuring that their charred bodies would be left on display for 'first responders'. Of course, this doesn't come up. There's some crazy nonsense victimology going on in the next scene, as they use circular and self-reinforcing logic to try to pull a fast one on the audience. First they announce that killers are often familiar with their earliest victims, which is true (we covet what we see every day, Clarice), but then jump to the conclusion that if he knew one of the victims (which is still a wild guess), then there's a good chance he knew all of them! A statement that is both completely incompatible with all available real information about serial killers, and everything the team has ever encountered while working cases on the show. Anyhoo, they go to talk to a the wife of the latest victim, hoping that their random suspicion will turn out to be accurate, and she'll remember a black guy in a hoodie publicly threatening to murder her husband. Emily proves to be terrible at victim counseling - the wife asks to see a photo of her husband's body, and she's forced to break the news about his manner of death, which the wife handles in a predictably terrible fashion. Isn't Emily supposed to be a psychologist of some manner? I know she used political connections to get transferred into the unit, but still... Here's a tip for avoiding Emily's faux pas in case you ever find yourself in that situation, offered in the form of a paraphrasment from Ernie Hudson's breakthrough role: If someone asks you if their husband was alive when his body was set on fire, YOU SAY NO! The wife is then handed off to Joe for some light hypnosis to help her remember the details of her husband's abduction. Not sure why they did the intro scene with Emily - couldn't we have cut that and gone straight to Joe, or just had Emily do the watch-waving? This feels like a reshoot/editing situation. Thinking back over the parade they went to, the wife remembers the husband splitting off to get some Mexican food while she bought a gyro. Joe asks her who was sitting near her husband, and she remembers a monster with a badly-burned face. I'm not exactly clear on how this guy could have clubbed a man of equal size into submission and then disappeared into a huge crowd, but I'm sure that will be explained. I'm kidding, of course - this show is no more concerned with plausibility than it is filling plot holes! In the conference room they're running full-tilt with the premise (based on nothing, I'll remind you) that the killer knew all of his victims. So it should be just a simple matter of checking who among all of the victims knew a horribly burned guy. While they're looking into it, the killer kidnaps a guy from an SUV while the victim's young daughter sings a religious song! Devilish! Now they've got a witness to the van, at least. Before the team gets the call about the abduction there's just enough time for some truly bizarre pseudopsychological nonsense - Emily asserts that by choosing to burn people in the 'heart' of rivertown and the 'core' of the buildings, the killer must be subconsciously saying that whatever grievance drove him to this, it's something that effected him deeply and profoundly! Thanks, Emily. Because the fact that a burn victim has started abducting people and charring them to the bone wasn't enough of a clue that he's had a profound disappointment in his life. Also, if he wasn't trying to send the cops a clue about his emotional state, he'd be burning people in a suburban mall in the middle of the afternoon - after all, it's not like he's picking the insides of abandoned buildings for reasons as prosaic as not wanting to get caught, right? Despite avoiding the most obvious clue, Penelope still manages to find the killer, whose name is 'Kaman' - I feel my mistake was a fair one. While the killer tries to avoid roadblocks, the team gets some of his backstory: He was a rough kid who got his act together, but was then in a car accident caused by an old criminal buddy, and was horribly burned, causing him to lose everything he cared about! And now he's been getting revenge on everyone who slighted him, like the landlord who kicked him out of his apartment while he was in the hospital, and the contractor who fired him! Also eight other people, who the writers aren't going to bother inventing connections to, naturally. The team rushes to his home, even though there's no reason to believe he'd be there, since they know he's driving around with a victim in his van, and he doesn't burn people in his house and then move them somewhere else. Maybe they can find a list of the places he's planning to use as burn sites! While not finding anything of consequence, Emily and Derek drop some more nonsense, saying that grabbing the contractor must have be a sign that he's devolving, since it was such a risky move, what with there being a witness and all. Yes - grabbing a guy late at night on a dark street when you don't know there's a little girl in his car is way, way riskier than somehow clubbing a man in the middle of a literal parade of witnesses and then dragging him to your murdervan. With his planned burn site off the table, Kaman stops the van and drags the contractor out in the middle of a parking lot. The man is doused in gasoline, set on fire, and then let run wild. Naturally, instead of stopping, dropping, and rolling, the stuntman instead runs directly into the path of an oncoming car. Wow. You know that guy's dead. The team rushes to the scene, and discovers that Kaman simply ran off, rather than getting back into his van. Theoretically this should make him easy to catch, but the cops have absolutely no luck in tracking down the monster in the hoodie who can only get around by limping slowly. Actually, the cops may not be involved yet - despite the fact that they're chasing a serial killer, the only evidence of Detroit government involvement are Ernie and his fire trucks. I know arson investigators take point on fire-related crimes, but should he really be running a manhunt? Amazingly they ask Penelope to 'scan the backgrounds of the photos' to look for information. Really, Emily? 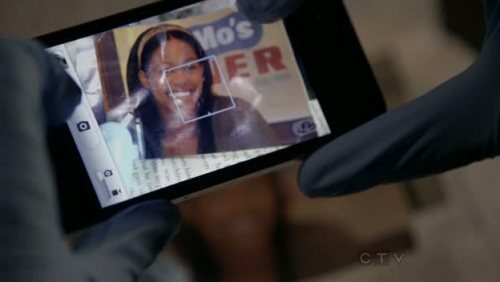 You're too busy to just look at the photo yourself and ask Penelope to search for something like Mo's Diner? Laziness is not a virtue, people. Kaman runs to 'Jay-Mo's Diner', which is run by Alias' Carl Lumbly! Who's also the father of Kaman's ex-girlfriend. He wants to see her one more time before the cops put him away, which seems like a totally reasonable request. Jay-Mo won't give up the information, though, and gets beaten for his trouble. We've already seen the 'Mo' in the picture, so that's that, but the second claim is just bizarre. Pictures 2 and 4 are clearly outside - two is even in a place with ivy on the wall behind her! While the first one shows her next to a shelf, allowing for extrapolation that they're inside the diner, there's no solid evidence to suggest it. Wow! Although I've got to say that's not an ideal place for a diner. Garages on either side? What kind of foot traffic are you going to get? It's almost like they dummied up a storefront in an alley in the warehouse district somewhere so that they could set off an explosion one night without bothering anyone. 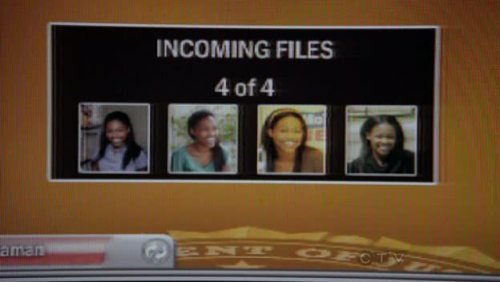 In what might be the most preposterous use of 'profiling' I've ever seen on the show, Greg and the team have to figure out who the girl in the pictures entirely based on Carl's assumed emotional connection to her. They assume this because Carl 'went through hell' to protect her. How do they know this, exactly? I mean, yes, that's what happened, but how could they possibly know it? Kaman has been beating people up and burning them for no reason at all - if Carl had given up the woman's location immediately, does anyone on the team really think that Kaman wouldn't have still beaten him to within an inch of his life and then set the business on fire? Oh, right, here's what I was supposed to be complaining about - instead of asking Carl who the woman is or where she is, he simply asks 'is she close by?' And Carl, even though he's capable of speaking in clipped sentences says 'yes' and 'save her', rather than giving them any useful information, such as 'my daughter' or 'my sister's house'. 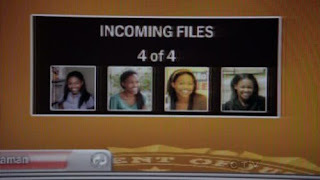 Which is who and where she is, respectively. Still the team manages to figure it out, and rushes to the house, but gets there far too late to be of any use. Kaman was going to set the place on fire, but when he finds out the reason that the woman broke up with him was that she was pregnant and worried about letting their son near an angry burn victim, he gives up. Except for a coda where Greg's son decides to go out for Halloween as an FBI agent! Here is the partial credit I'll give Greg this - instead of shooting Kaman when he arrives at the house, he says 'hey, maybe you don't want to burn your son alive, huh?' and it totally works! There was a witness. And all of those people who wound up burned to death had somehow crossed a monstrous burn victim. Seriously, when the first victim was kidnapped and burned alive, how did the investigation not uncover the fact that two years earlier that same man had been responsible for a car accident that burned a guy nearly to death? And that the selfsame burn victim had gotten out of the hospital just a short time before the crime? Wouldn't this really solve itself? 1/10 - I almost gave this one a zero. Everything went the killer's way at every turn, and he was only caught because of things unrelated to the team. There was a witness that led to roadblocks, but after that, everything went Kaman's way. Even if Greg hadn't shown up, he probably would have surrendered rather than killing his own child. The real failure this week was victimology. The team jumped to the conclusion right at the beginning that the killer probably knew his first victim. Then they proceeded to do... absolutely no research into the first victim to determine if someone would have had a grudge against him! 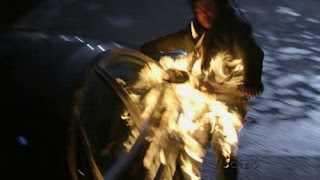 Five seconds of Penelope typing would have revealed that he'd caused a man to almost be burned to death, but the team didn't bother. And that unwillingness to do the most basic research cost a man his life. Bravo, Team! Oh, and just one more time - how did a crippled burn victim abduct a healthy man in the middle of a crowd without anyone noticing? They never actually told us. I really thought there'd be an actual connection to Devil's Night, since that's when he kills. They made an effort to tell us at the beginning about all of the arson attacks taking place on Devil's Night (useful information to those of us who, being British, have never heard of Devil's Night), so I thought he'd have been burned in an arson attack one year and be taking his revenge on the holiday by burning people out enjoying it, or something. Did they actually explain why he chose to burn people at this time of year, and never at any other time, forcing him to work through his kill list in an elaborately slow fashion, possibly taking years? Why did Hotch call his son "my little G-Man"? That's the 3rd time the show's made reference to a "G-Man", though I can't remember the circumstances of the 2nd. 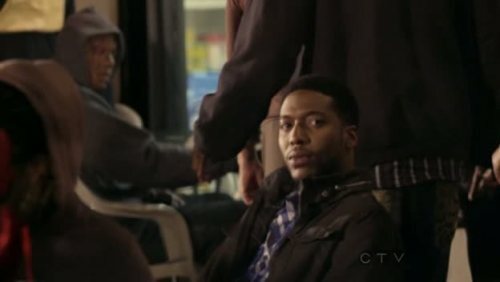 When Garcia called Reid "Junior G-Man" in series 1, I actually thought she was referring to him being Gideon's protege - but does it mean something else? And on a side note, I am getting mightily sick of the team's use of their bullsh*t "cognitive interviews". Really, they are just nonsense. In the US, "G-man" is sort of an old-fashioned term for a special agents of the US government, usually of the FBI. It's especially associated with a sort of mobster/film noir style. Who is "Greg"??? Aaron Hotchner is played by Thomas Gibson...I can't figure out where the name Greg is coming from.